I have a possible meteorite that I purchased off of eBay a while back. I have been tempted to cut a "window" into it confirm if it is what the seller said it was, a Campo del Cielo meteorite. I am asking here in hopes that someone will be able to identify it without having to do such a destructive test or tell me of a non-destructive way to test it. I should also mention it is approximately 410 grams, and I will attach pictures showing dimensions and surface features. 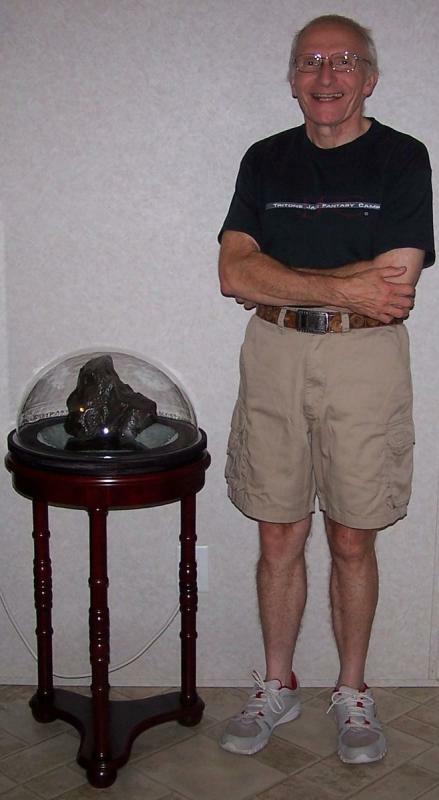 Looks like a real iron meteorite to me. Campo del Cielo is common and readily available on the market. Looks similar to the smaller Campo del Cielo examples that I have. Have you tried a magnet on it? FWIW, as I understand it, some time ago the Argentine gov't shut down collection and export of pieces of the meteorite from that fall. But, lots were collected and sold prior to that dictum. All looks good. First things first, is it magnetic? If so, your next non destructive test would be to test for Nickel. If that is positive then you are good to go. Look on line for nickel test kits or take it to your local university geology dept. Certainly looks like a Campo, I wouldn't worry about it. You'd gain nothing from cutting a window unless you also etched and polished one or both surfaces. It's not a trivial cut to make, either. Not something that readily can be done with a hacksaw. Testing for nickel is not necessarily diagnostic, if you're going to take it to a lab or geology department, a quick scan with an XRF will reveal whether or not to metal content matches Campos. But again, as others above have said, Campos are easily obtainable, and the appearance is a good match. Thanks to all that replied so quickly! Yes, it is attracted to a magnet, quite strongly in fact. I will have to try a nickel test kit next as suggested by Steve. If anyone knows of any other non-destructive tests, or where I could go to get it authenticated, please let me know. That is truly a spectacular specimen Tom! If you don't mind, I would love to know how you acquired it and what something like that costs. I would love to take this specimen to my local university to see if they would be kind enough to scan it for me. I will have to try that later and I feel that is probably the most accurate way of authenticating it. Astromart... 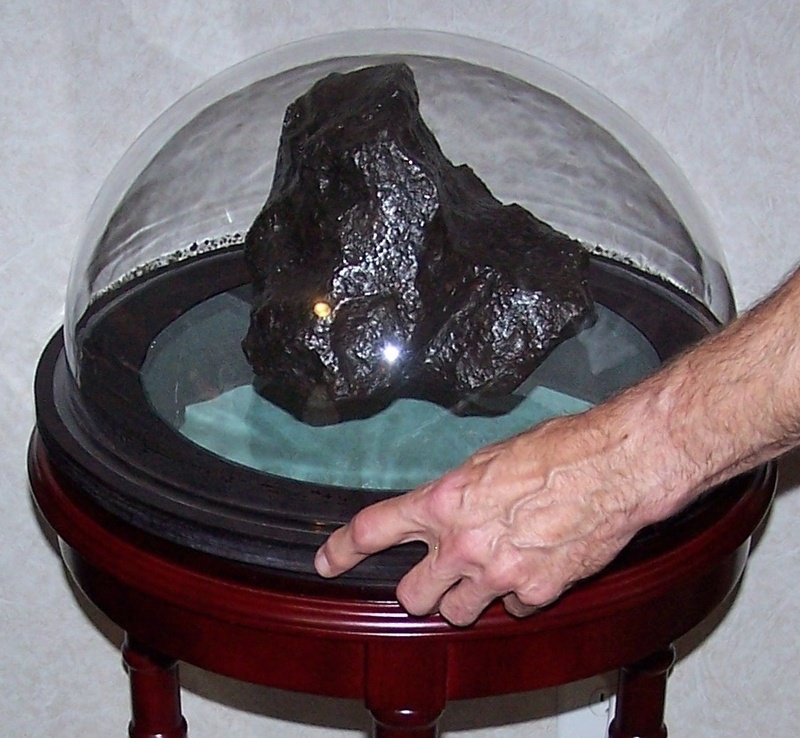 Nothing like a "gently-used meteorite, as new" for a bargain price! Absolutely amazing! 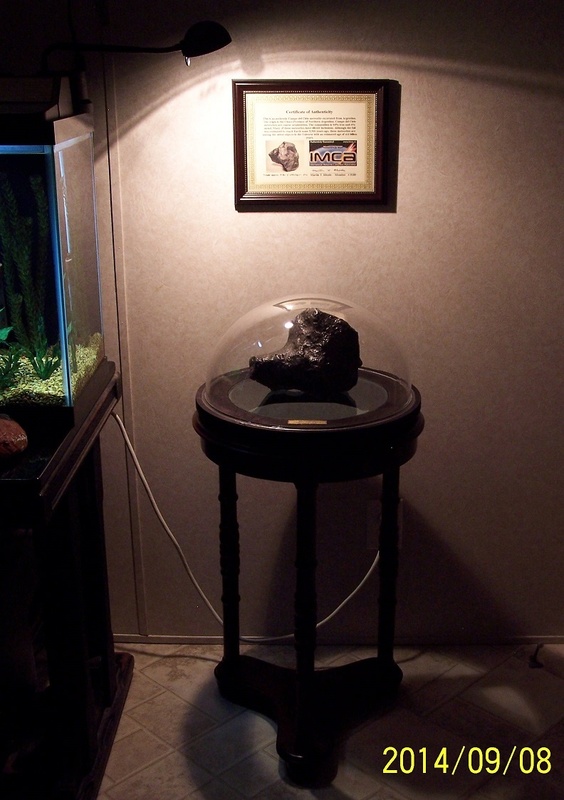 The stand and glass cover works perfectly with the meteorite. Beautiful piece! Just a thought but how about measuring its density? Will this be consistent (or even diagnostic) across Campo fragments? Edited by Kingstepper, 13 April 2019 - 08:13 PM. No, probably not. The density will vary with the presence or absence of silicates. If these are present in the interior, the density would be lower, but without the ability to determine why. I should qualify my remarks above. The density test would certainly indicate if the specimen has the proper value to indicate a composition of mostly iron, so it would rule out any iron bearing terrestrial rocks. For that reason, it would be of value. Composition among irons does vary though, even within a specific type, so density wouldn't be a reliable diagnostic tool. But it was a good thought! Edited by lee14, 15 April 2019 - 03:59 PM.